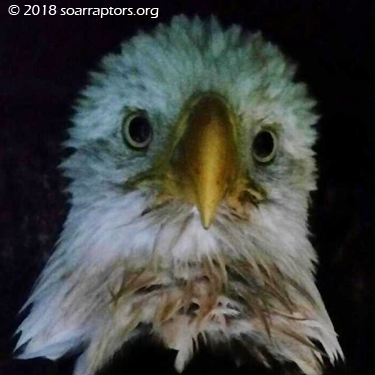 Adult female bald eagle admitted from Wright County, Iowa on 12 September 2018 with elevated lead levels. The first of the 2018-19 hunting season. Where did the lead come from, it’s not deer hunting season, yet? The only hunting seasons open at the time of this eagle’s admit are cottontail rabbit, squirrel, and dove season that all opened September 1. The youth and disable hunter deer season opened this past Saturday, September 15. Eagle digestive systems are so efficient that we don’t know what she ate, but whatever she ate must’ve contained lead ammunition fragments. Please hunt and fish lead-free and if you are not a hunter or angler, one, please understand we are, and two, help those that do hunt and fish to understand how they can go lead-free. Here are a couple of our website pages to help the conversation get started! The links on these pages listed were checked 9/19/2018, but if you find a bad link, please email Linette!